Remember when you needed to smooth out those joists? When you had to make those uneven boards flush? 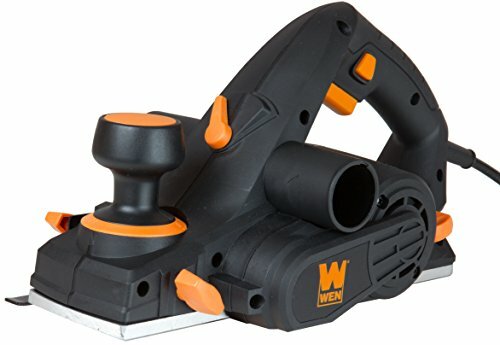 Plane away chips, splinters and misshapen edges with the WEN 6 Amp 3-1/4 inches Electric Hand Planer. Perfect for fixing stubborn doors or fitting wood. This power planer’s 6-amp motor delivers over 34,000 cuts per minute to your workpiece, slicing away any irregularities until the surface of your boards are aligned and smooth. With a cutting width of 3-1/4 inches and a maximum cutting depth of 1/8 inch, you’ll have the perfect companion for fitting and squaring boards. The 16 positive stops increase in increments of 1/128 inch anywhere from 0 all the way up to 1/8 inches. The base plate shoe even includes a v-shaped groove for chamfering to easily flatten sharp board corners. Remember when you had a reliable planer that lasted for years? Remember WEN. 16 positive stops increase in increments of 1/128 inch anywhere from 0 all the way up to 1/8 of an inch. Kickstand prevents any unintentional blade-to-workpiece contact during times of rest. With the simple flick of the switch, change the directional aim of the sawdust from left to right. Dust bag attaches to either side of the planer. The blade drum with two double-sided blades rotate at 17,000 RPM to ensure a clean and smooth cut. Blades are reversible and easy-to-replace. If you have any questions please contact us through “Ask seller a question” link. Our electronic products are only designed for use within the USA.We cannot guarantee they will work properly elsewhere. Using a converter is at your own risk.